Caravans and me, not did I ever think that combination would ever come to fruition. I had a very simple philosophy, if you are going on holiday, your accommodation should be as good as, if not better than where you ordinarily rest your head. Otherwise, how can it be a holiday? Mrs Hatt came along and managed to change that view, in fact over the years I’ve come to look forward to emptying out the chemical toilet in a morning. What better place to form a queue and talk about how bloody cold it had been the night before? 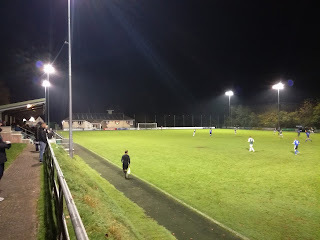 In all seriousness though, I did grow to like it, and thanks to having the van down on the outskirts of Dawlish Warren, it has somewhat selfishly provided a great opportunity to watch football at venues that ordinarily I would never set foot in. In fact, one Easter Weekend, I was given the pass out to beat all pass out’s when I managed Buckland Athletic on the Thursday, Plymstock United and Plymouth Argyle on the Friday, Torquay United on the Saturday and then a further double on the Monday at St Martins and Totnes & Dartington. I had some making up to do! With another weekend to Devon booked with the extended family, and the prospect of sleeping in a ‘pod’, which is effectively a tent attached to an awning attached to a caravan, I was looking forward to testing out two of my ailments, a bad back and claustrophobia, plus the fact I’m six foot two and don’t actually fit very well into a tent! County Football Association Ground in Newton Abbot, the home of Plymouth Argyle Reserves. 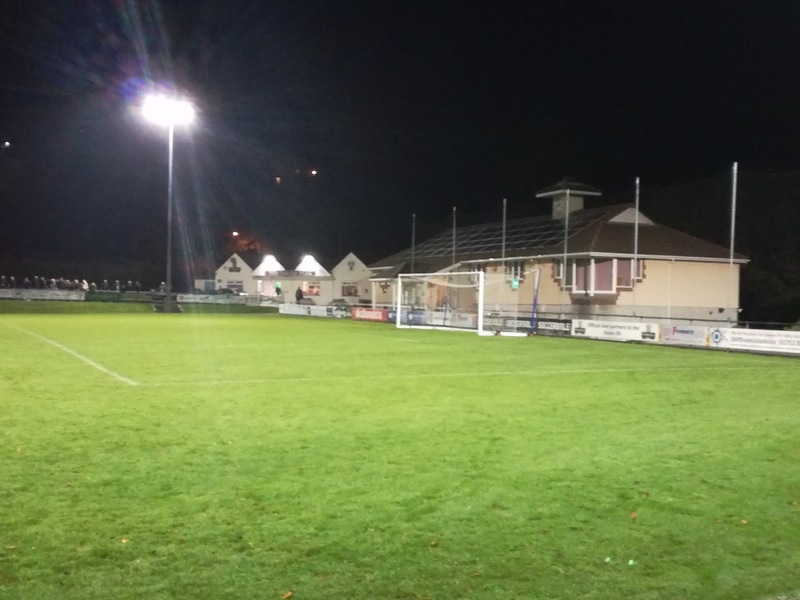 I have a huge amount of time and respect for the South West Peninsula League, it’s brilliantly ran by Phil Hiscox, and prides itself on its social media, and the importance of keeping the fans updated with all things that matter. Not only that, it publishes it’s fixtures for the full season, rarely moves them, and tries to cater for the neutral by setting up opportunities to watch multiple games in short spaces of time, weekend and Bank Holidays in particular. The arrival of Plymouth Argyle Reserves was a touch contentious though. 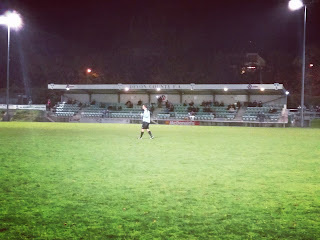 Members of the Western League for a number of years until 1993, they joined the SWPL in its First Division (Step 7) in 2015, finishing runners up at the first attempt. They then took a place in the Premier Division and finished sixth in the table, whereas this season they sat in second place prior to tonight’s game. Well, reserve teams in the football pyramid always creates a bit of controversy, but a reserve team of a professional outfit from the Football League? This was a bit unusual in this day and age. The problem arises because in terms of the opposition, you simply don’t know what you are going to be playing against. One week it could be an entire youth team, another week a number of first teamers may end up on the team sheet, and the question that raises is not so much about the relative merits of Plymouth Argyle's chances of winning the league, but the issue of fielding wholly different sides week in and week out. How fair is that on the teams they are playing? For example, a team needing to win against Argyle to win the league, may find themselves up against a team of eighteen year olds, whereas the following week a side needing points to avoid relegation may come up against a number of players who had played in front of 20,000 against Portsmouth the week before? I don’t have a view either way to be honest, and interestingly the Chairman of Plymouth Parkway, who incidentally lead the league, wrote in the local media that he had no issue with Argyle and their methods, but for every Parkway Chairman, there are others that share a different view. The league are not to blame for this, if anyone is to be held accountable it is the FA, they accepted Argyle’s application to join the football pyramid and it was they who allocated them to the SWPL. 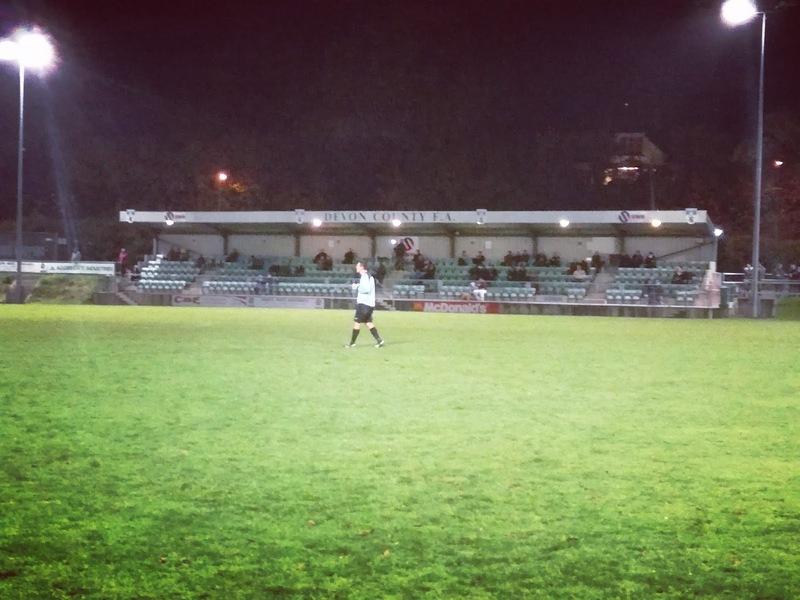 Headquarters to the left and a clubhouse, called ‘The Corner Flag’ to the right. 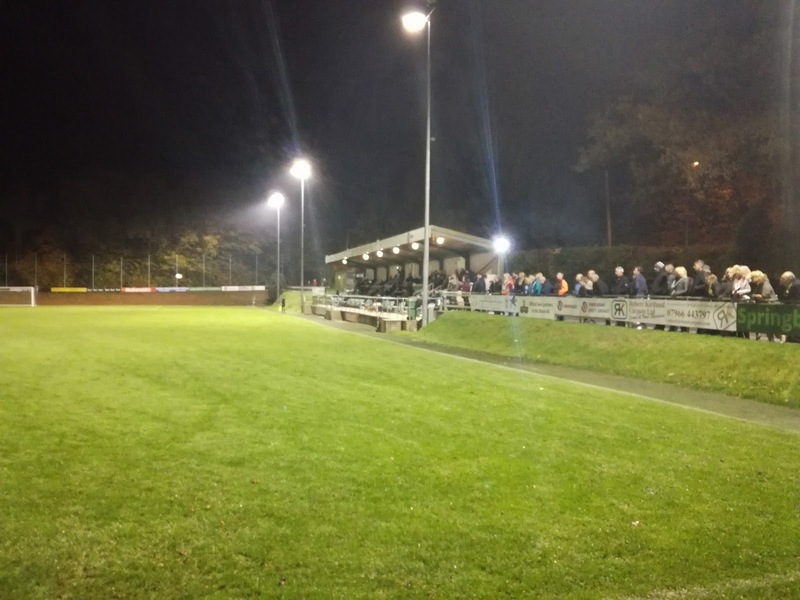 Just the one stand sits on the halfway line with around 300 seats in it, but with a raised view it provides an excellent viewing platform for the spectator. The rest of the ground is hard standing, but at the far end the pitch looks like it’s been leveled and as a result the standing areas give another superb elevated view. 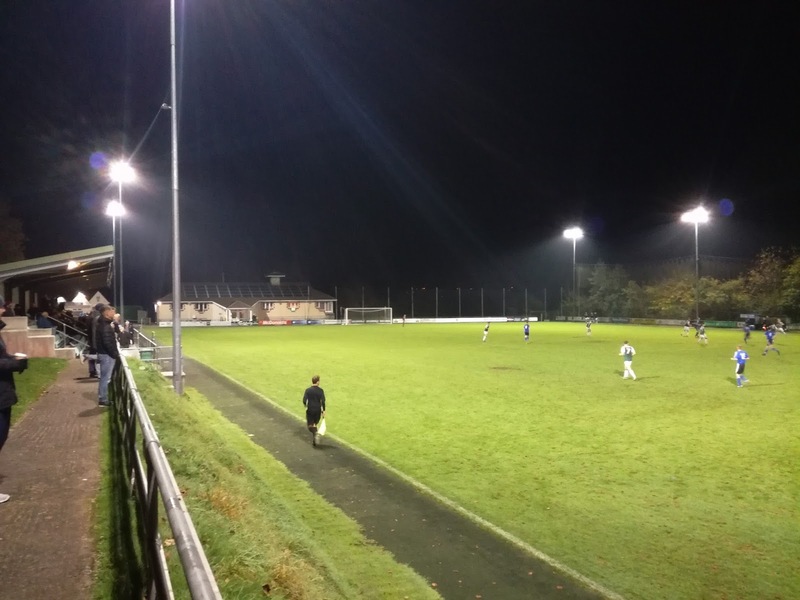 Ivybridge were sat in one of the relegation places pre-match, and were managed by former Blackburn Rovers centre half Nicky Marker. Managing the Argyle lads was Kevin Nancekivell, one of the best non-league footballers of his era I saw, when he pulled the strings and scored bucket loads of goals for the all-conquering Tiverton Town side. Ivybridge took the lead in front of a healthy crowd on a chilly night via Joe Truelove who scored in the 22nd minute, but less than a minute later it was 1-1 thanks to a really well finished effort from Alex Battle following a fine flowing move. Argyle were playing some nice stuff but Ivybridge were sticking to their task, defending stoutly but not trying to be too clever in possession. Ivybridge took the lead on the hour mark thanks to a fantastic strike from Reece Shanley, and in all fairness, despite Argyle’s possession, the chances they created were at a premium, and in the end, despite having their backs to the wall for significant periods, Ivybridge’s endeavour and commitment saw them deservedly take the points, and boy did they celebrate at the final whistle. So what of Argyle’s Reserves? If they win the league, do they go into the Western League? I guess they do, but that would involve more travelling, but I suppose that doesn’t matter when you are full time. 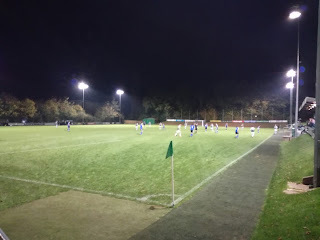 My own observations on the night were that the side they put out were young, but they were very fit and skillful, however, they lost to a side in the relegation zone, at home. I don’t know whether any players with first team experience played, maybe they did, maybe they didn’t, either way, they are not trouncing all and sundry so the balance can’t be that bad can it? As for the tent, well, after a few lagers I backed myself into it, the feet hung out the front and the cold night air meant a double sleeping bag situation arose. But it’s a small price to pay to watch football in what I consider to be the best semi-professional league in the Country, bar none.